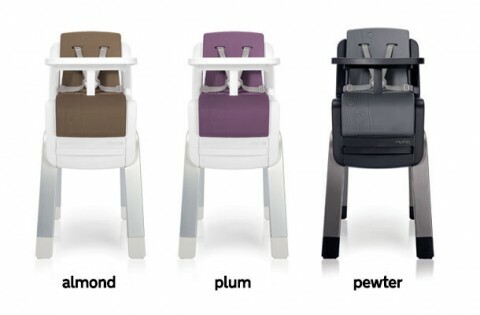 I recently published the top 10 high chairs for 2013, but I’m going to have to find a way to squeeze the Zaaz from Nuna onto that list. ZAAZ DEMO VIDEO from Nuna on Vimeo. I love the look of this sturdy chair through all its stages. It’s a truly modern, stylish seat both as a high chair and as a child’s chair. It comes in three color combinations and I’d say if there’s any room for improvement for the Zaaz it lies in the color choices. I’d love to see all 7 of the European colors brought here as well. The Zaaz is a beautiful, easy to clean and highly adjustable high chair that should have made it onto our high chair list months ago. Retails for $250. 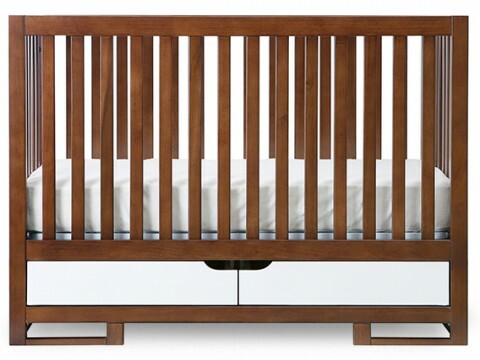 I’m thrilled to add the Oslo Crib from Karla Dubois to our modern crib guide. 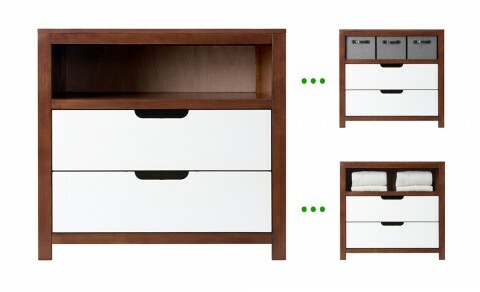 This two-tone crib with storage drawers is a fantastic addition to the under $500 category. The matching dresser is equally beautiful and full of useful storage space with customizable panel dividers in the drawers. You can currently find the Oslo collection at Buy Buy Baby. Both the crib and dresser retail for about $400. Project Nursery is doing a giveaway of the crib and dresser right now through Friday, May 3rd so if you like this as much as I do, be sure to enter! 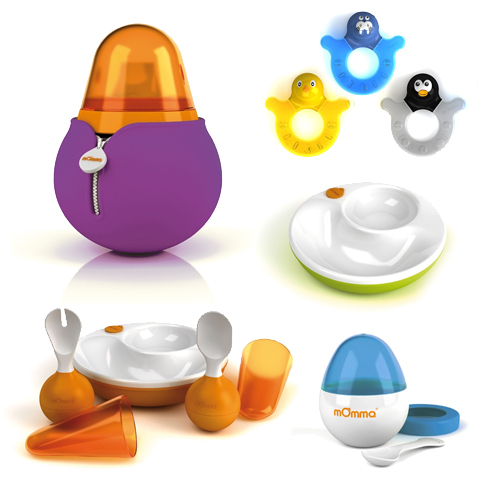 A Swiss company with a goal of creating a “modern, innovative, design oriented, colorful and functional line of baby products, ” mOmma hits the nail on the head for your modern feeding gear needs. Drinktime, mealtime, and teething items are stylish enough to proudly display on your dining table, and the mOmmaVogue looks clever enough to become a conversation piece when pulled out of a diaper bag at a playdate. I wish their non-spill, roly-poly drinktime product line was also sized for adults, the brilliant colors would be fun to look at while in the office or at home. You could even customize your little one’s mOmma collection to match your decor. 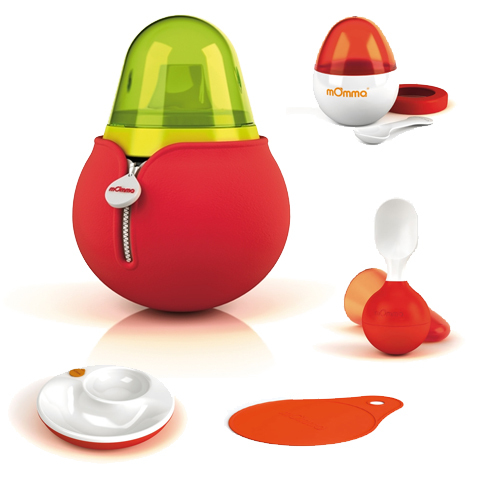 The pieces are available in Red, Orange, Blue and Green. You can find mOmma products online at Diapers.com and Amazon.com. 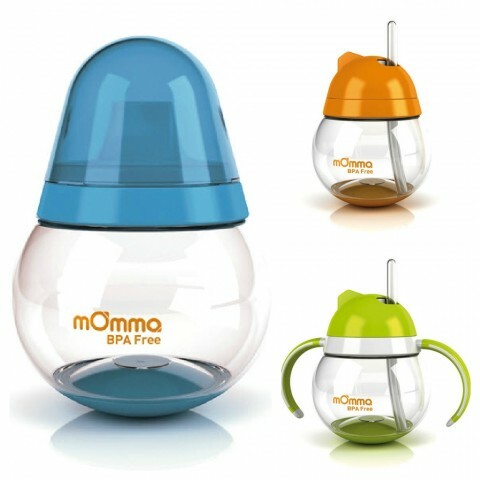 We’ve just added mOmma to our Buy Modern Baby Feeding Guide where you can find all our modern baby feeding picks. It’s hard to tell you much about many types of diaper bags if I haven’t seen them in person. I have yet to find a shop full of luxury diaper bags. If there IS such a store, PLEASE let me know so I can visit. I recently added Tribe Bags to our Modern Diaper Bags Guide but I really wanted to see the bags and touch one before I could share it with you. Lucky for me, the friendly folks at Tribe Bags were kind enough to send me a sample to review. Tribe offers three styles of diaper bags. From left to right there is the Singapore Sling, the Orchard Tote and the Raffles Bag. All three are gorgeous and I wouldn’t mind having one of each! I received the Raffles Bag and was immediately impressed. The packaging and presentation was lovely and I appreciated the quality of leather and the number of pockets and compartments. The bag is fancier (and more expensive) than any bag I own. It is approximately 11″ x 14″ x 6″ and can be worn over the shoulder or across the body (which is my preferred way to carry any large bag). The bag is neutral enough to use with baby or without, and dads won’t be embarrassed to carry it. As my “test drive”, I used the Raffles Bag as my carry on and outing bag for my family vacation this summer. The bag has plenty of space for everything you’d need for baby for several hours out of the house without being an entire piece of luggage. 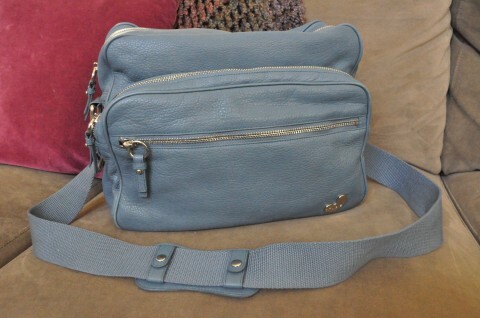 It is compact enough to be used as an ordinary bag without looking like an overnighter. For the plane I had the bag stuffed with wipes, changes of clothes for both my boys, my travel pillow (about the size of 8-10 diapers), my ipad, phone, chargers, headphones, coloring book, markers, and all the other little things people carry in their bags. This was the only bag I carried around for the entire 9 days of my trip and not only did it keep me organized with everything I needed and more, it’s really cute and I felt good walking around with it. It wouldn’t be obvious to anyone that I was carrying a “diaper” bag. 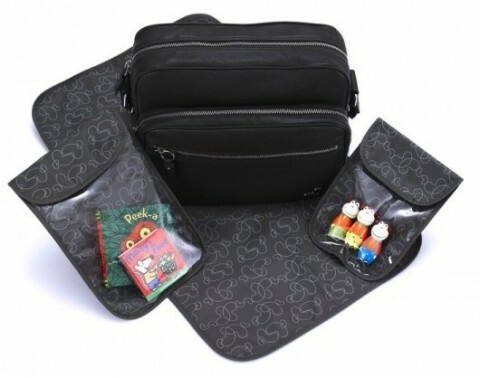 Tribe Bags come with 2 plastic pouches with a clear layer to see inside and a changing pad. I used the pouches to hold activities to keep my boys entertained at restaurants. The pouches were convenient and easily accessible. My only issue with the bag was I found the zippers to be stiff and sometimes difficult to close. 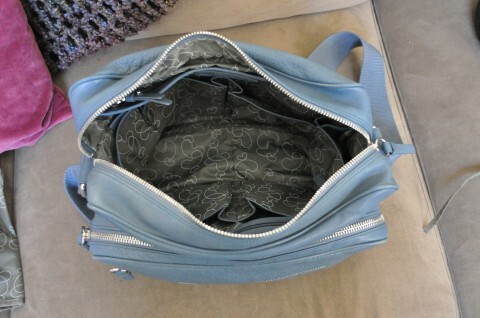 I never had to worry about things slipping out of the bag like with my other diaper bags, but I felt a little slowed down when messing around with the zippers. 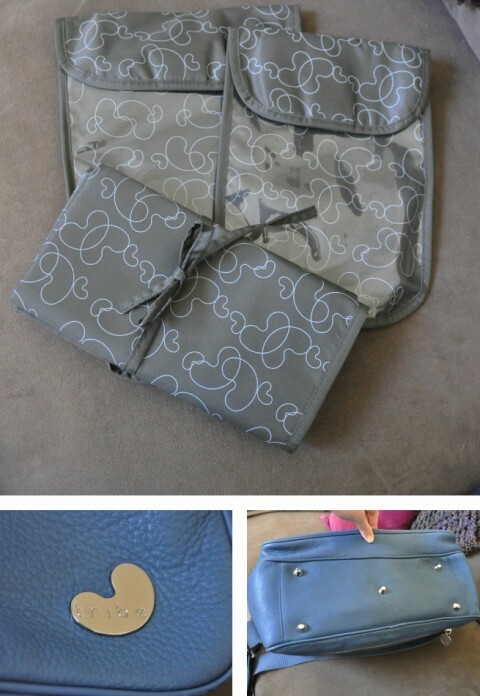 Have you ever had a diaper bag with zippers before? Were they a problem for you? Let me know in the comment re: zippers on diaper bags. The Raffles Bag retails for about $420 (converted from Singapore Dollars) so it’s pricey, but the quality of the materials and the details are what you’d expect from a luxury bag. I think I’ll be carrying this one at ABC Kids Expo next month, so those of you who are there can check it out in person. 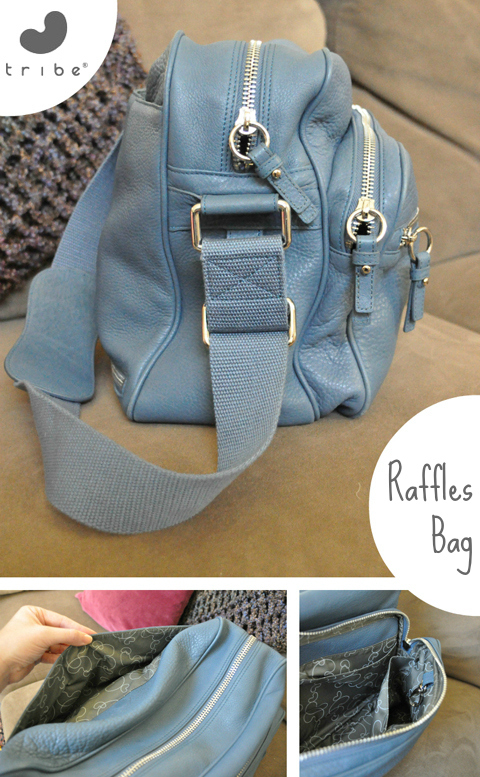 I was not compensated for this post, but Tribe Bags did sent me the Raffle Bag. My opinions are entirely my own. I love a great glider, probably because years ago I had so much trouble finding one. 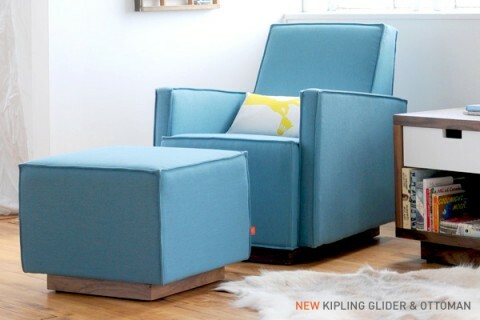 Today I’m excited to share Gus* Modern’s new Kipling Glider and Ottoman with you. The geometric shape is inspired by children’s wood blocks and the upholstery features French seams that are pretty popular right now. The Walnut base is easy to coordinate with many other modern nursery pieces. The Kipling Glider and Ottoman come in this Muskoka Surf color as well as a gray called Baldwin Mist. They retail for about $1400 ($1000 for the chair and $400 for the ottoman if you’re considering them separately) but right now the set is on sale for $1120. You can find it online at 2modern, YLiving, Bobby Berk Home, babygeared and other great online shops. 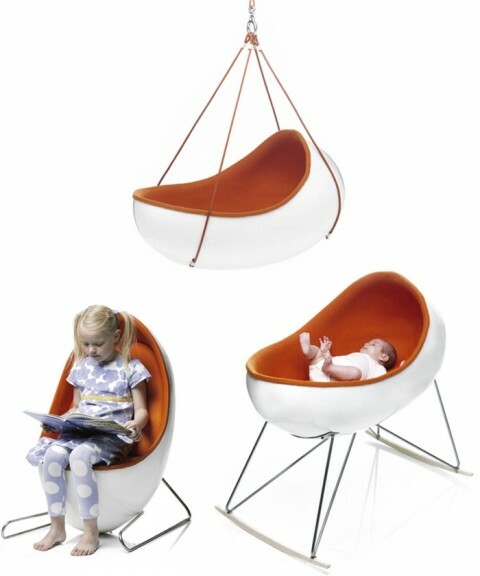 The Cradle by Kåre Frandsen is a gorgeous space age pod style cradle or bassinet. 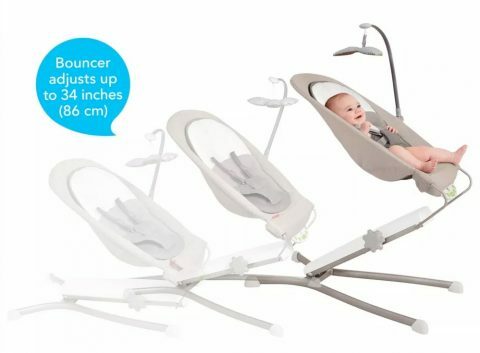 You can get this beauty at babygeared for $3000 plus $200 to ship it. I sure hope it includes all the conversion parts in the price. This is BY FAR the most expensive bassinet on our list. I love rocking horses. They do double duty as toy and decor. 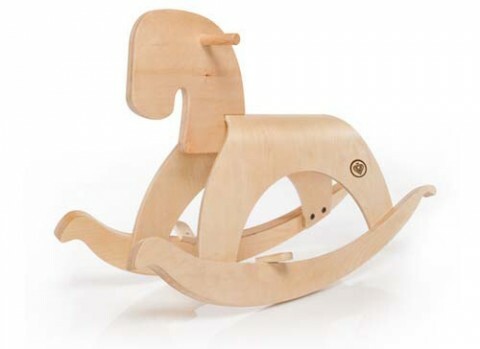 Modern rocking horses pay homage to traditional nursery toys while updating them to fit in our present day aesthetic. I think the Woody Rocking Horse from Prince Lionheart does exactly that. It’s our newest addition to the toy guide at BuyModernToys (just scroll down the list to see all my recommended rocking horses). These retail for about $80 but you can get your own Woody Rocking Horse from our amazon affiliate for just under $57. For my full rocking horse gallery, see my Rocking Toys – Horses and More Pinterest board. Let me know which is your favorite!